Up for a little walk? 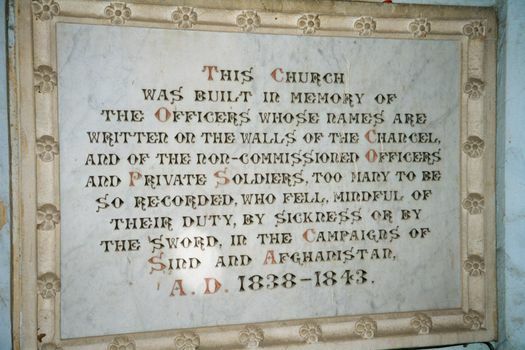 Say, from the Afghan Church north to the Crawford Market--not quite two miles? 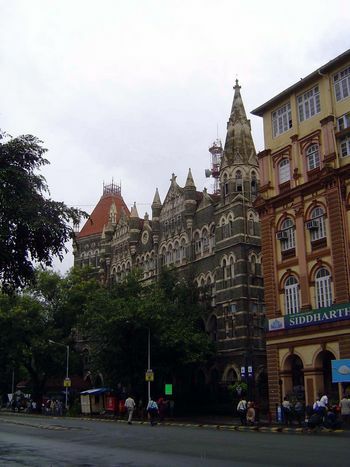 These are the two buildings that brought Bombay to the Gothic style, and between them there's now a standing parade of Gothic. 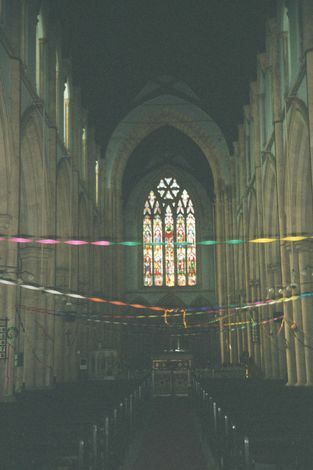 Andreas Wolwahsen, in Splendors of Imperial India (Prestel, 2004), suggests that the choice of styles was made by businessmen eager to "demonstrate their modernity and their links with parallel trends in Britain." Not that everyone liked it. Aldous Huxley, no fan of what he called "the darkest period of architectural history," came by and wrote that "Bombay is one of the most appalling cities of either hemisphere." Robert Byron, with a still sharper bite, dismissed the city as an "architectural Sodom." 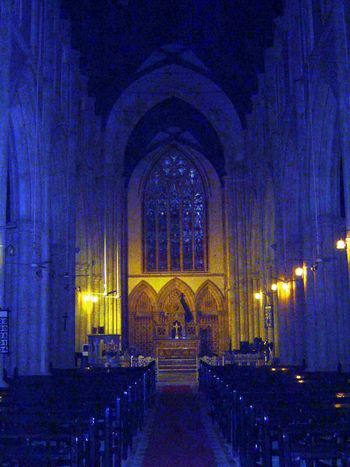 The earliest Gothic in Bombay: the appropriately dark Afghan Church, from 1858. An explanation of the name. 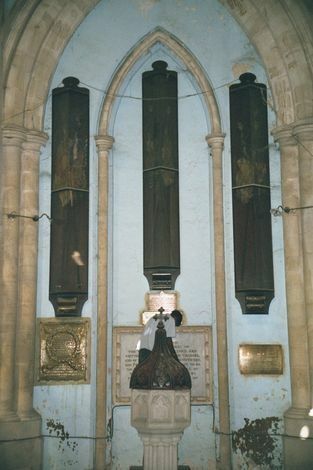 Also known as St. John's, the church was designed by Henry Conybeare, whose original plan, slimmer than this, was widened to gain structural stability. 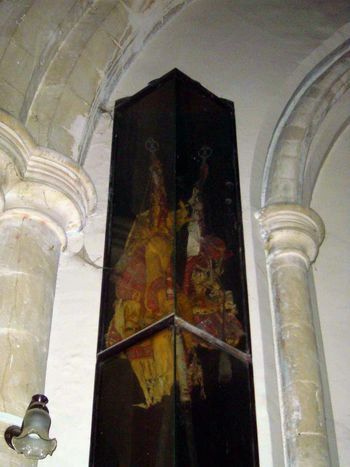 Wrapped up behind dust-darkened screens, the antique regimental standards. 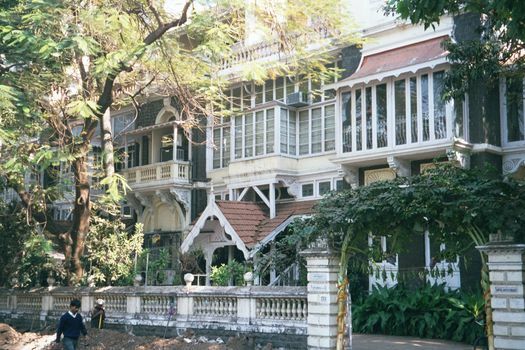 Housing nearby in Colaba. There was an Indian upper class, of course, most of whose members during the British period appeared to the British as either apolitical or enamored with British rule. Behind closed doors, however, it was a different story: there were plenty of apolitical grandmothers who would sooner have died than have an Englishman enter their home. 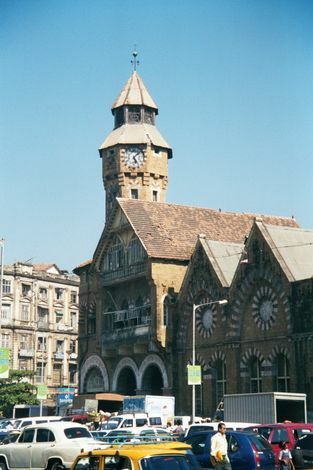 Head north, past the Prince of Wales Museum, and you come to Mahatma Gandhi(formerly Esplanade) Road. 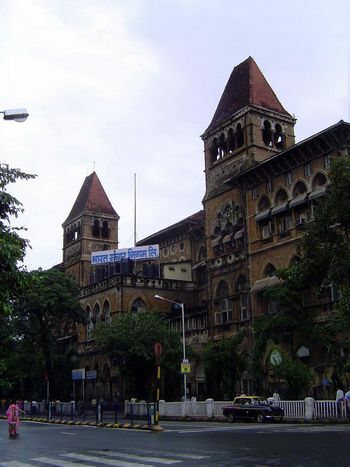 On your left: Elphinstone College and the Maharashtra Archives. 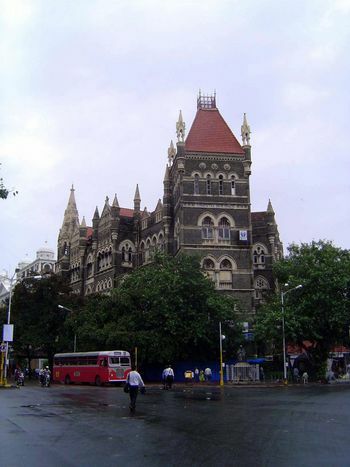 Behind Elphinstone College, there's another Gothic pile,this one built as the Presidential Secretariat. Inside, there's a plaque in the main entrance where the designer, Colonel Wilkins, is mentioned. So is Sir Bartle Frere, who was lucky enough to be governor of Bombay when civil war raged in the United States: international cotton prices went through the roof, and Bombay flourished. 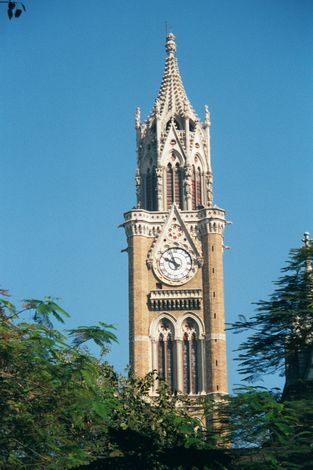 Adjoining the old secretariat on the north, this is Bombay University's Great University (or Rajabai) Tower (1869-78). 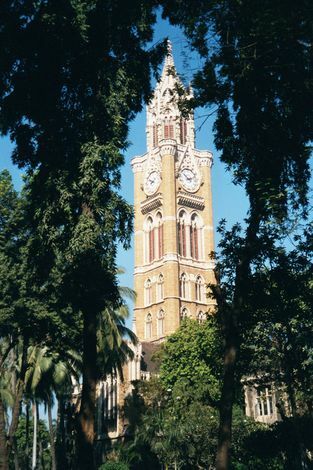 Bombay was rich enough to attract heavy architectural guns from London, including Sir Gilbert Scott, commissioned in this case by Premchand Raichand--from whose mother, named Rajabai, the tower takes its popular name. For a long time, this was the tallest structure in the city. 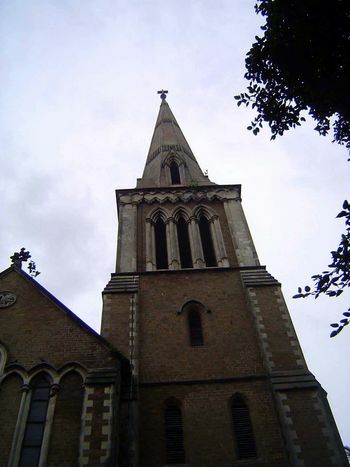 If it looks familiar, perhaps that's because Scott had a major hand in building Victorian London, including the St. Pancras Station and the Albert Memorial. Then again, Scott was drawing from older models, including Giotto's campanile in Florence. The clock formerly chimed "God Save the Queen" and, shifting from the patriotic to the nostalgic, "Home Sweet Home." Scott himself was much too busy to inspect either the site or the building. The same, from the campus grounds. The tower is attached to the university library, whose reading room remains a surprisingly peaceful place, perhaps because the digital invasion has marooned it on the shores of obsolescence. 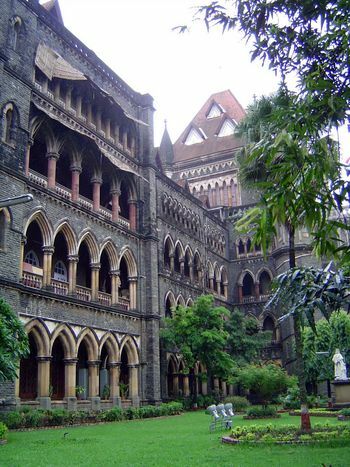 Just north of the library, this is the High Court, completed in 1878 to a design of James Augustus Fuller, who borrowed heavily from the design by George Edmund Street for the London Law Courts. 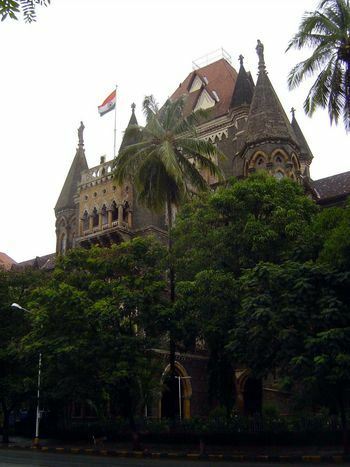 The statues are of Justice and Mercy, but crosses suggest that jurisprudence finally rests on Christianity, a point that Indians might contest. Still farther north, the New Post Office, by James Trubshawe and Walter Paris, 1871-4. By the 1920s it had been demoted to local service and was called the Old General Post Office. Across the street from the post office, these are the Oriental Buildings at the junction of Mahatma Gandhi (formerly Esplanade) and Naoroji (formerly Hornby) roads. 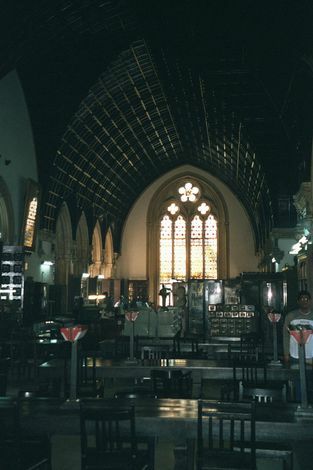 They're a good example of a Bombay commercial building in the Gothic style. 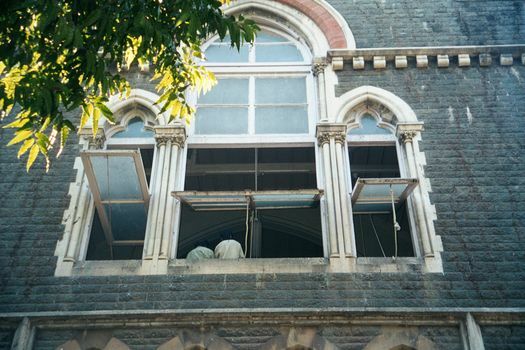 Continuing north on Naoroji (Hornby) Road beyond the VT (CST), this is the Jamshetjee Jeejeebhoy ("JJ") School of Art and Architecture (1877), with studio windows designed for the climate. For a time, Lockwood Kipling (Rudyard's father) was principal here. Lockwood Kipling had a hand here, too. 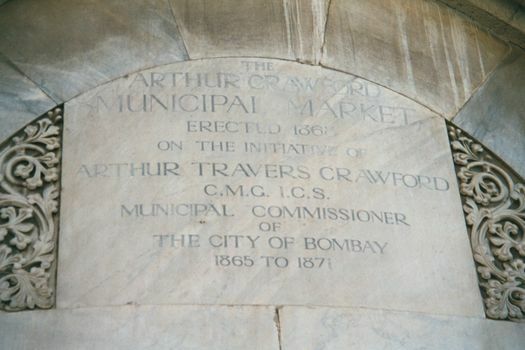 We're just across the street from the JJ School: this is the Crawford Market, named for Bombay's Municipal Commissioner Arthur Crawford. 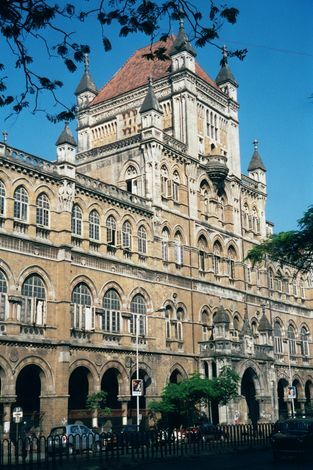 Begun in 1867, it is Bombay's first public building in the Gothic style. 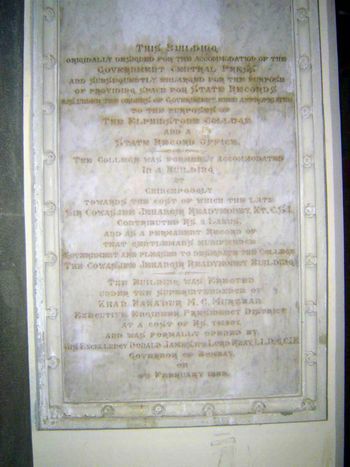 A plaque inside the clocktower. And who was Crawford? From David Gilmour's The Ruling Caste, 2005, comes this startling extract: "The most notorious case of corruption in Victorian India concerned Arthur Travers Crawford, a Bombay Civilian born in 1835 who behaved as if he were living in the India of Clive and nabobs. As a younger colleague reported, he had 'run away with two women, been separated from his own wife, and during one Poona season lived with two actresses whom he imported from America.'... 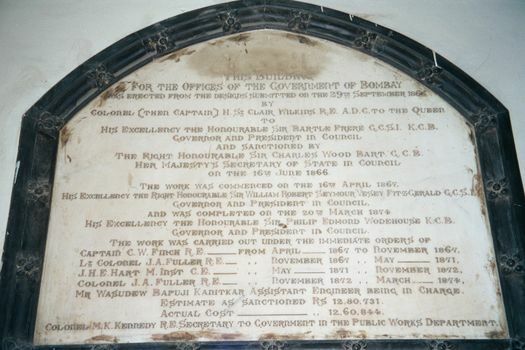 In 1874 he did not get the commissionership of Berar because of suggestions of impropriety.... During the mid-1880s Crawford's debts--chiefly the result of women and a large number of children--encouraged him to accept a variety of bribes, loans and advances from certain rajas in his division.... Placed under house arrest by his own Government in the summer of 1888, Crawford escaped from Poona, bolted for the sea and was apprehended in Bombay wearing a false beard.... The Secretary of State [was persuaded] to dismiss him without a pension." Still, his name was not scratched off this commemorative stone. 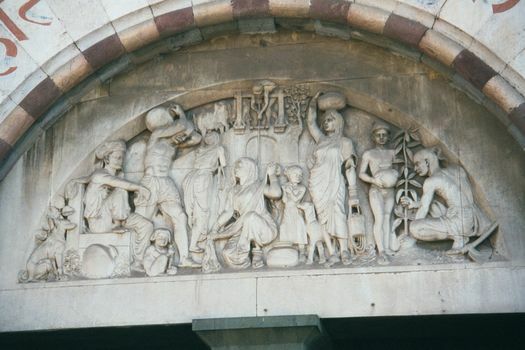 The entrance gates have bas-reliefs by Kipling; they show "natives" with different kinds of food. And you wonder where Rudyard got his imagination? Where's that electrician? The market sheds are roofed with a double layer of corrugated steel, which must have been a new material in the 1870s. 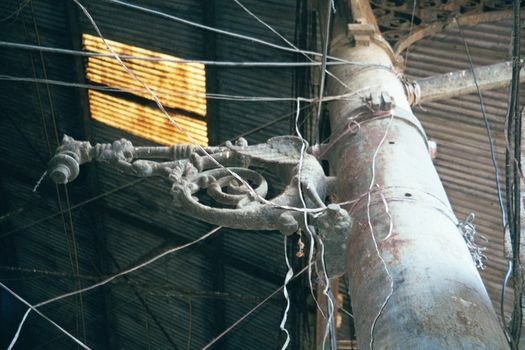 The reptile brackets and the rest of the ironwork were designed by a Mr. Russel-Aiken.